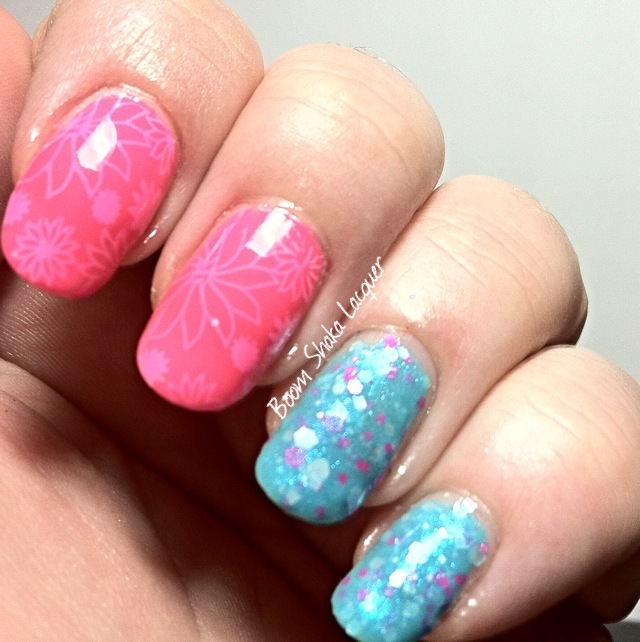 Wednesdays We Wear Pink – Featuring Jindie Nails! Hello again. We’ve reached another Wednesday and although I know I missed last week I’m back with another fantastic pink polish! Haha! See what I did there? I crack myself up! Anyway this beauty was a gift for some very patient customers who bore the wait for shipping due to some unforeseen circumstances. This in and of itself is one of the reasons that I love Jindie Nails. Jen really tries to go above and beyond for her loyal customers because she genuinely appreciates their support! Let me just say that usually I’m singing the praises of Jindie Nails’ crelly glitter polishes because honestly they are the first and still the best crelly glitters I’ve ever worn. There are other great ones out there don’t misunderstand me, but I will always love Jindies just a touch more. This one however is a gorgeous shimmery jelly base in a lovely hot pink. Floating amongst the jelly is a plethora of pastel matte and metallic dots and hexes and some metallic microglitter or shimmer. I love this polish. It was a dream to apply actually. It is a bit sheer if you have longer nails so you may need two and a half (as I did) to three coats. I didn’t have to fish for the larger glitters and for the most part they did all disperse nicely (I nudged a few errant glitters back into position with the brush as I was applying). 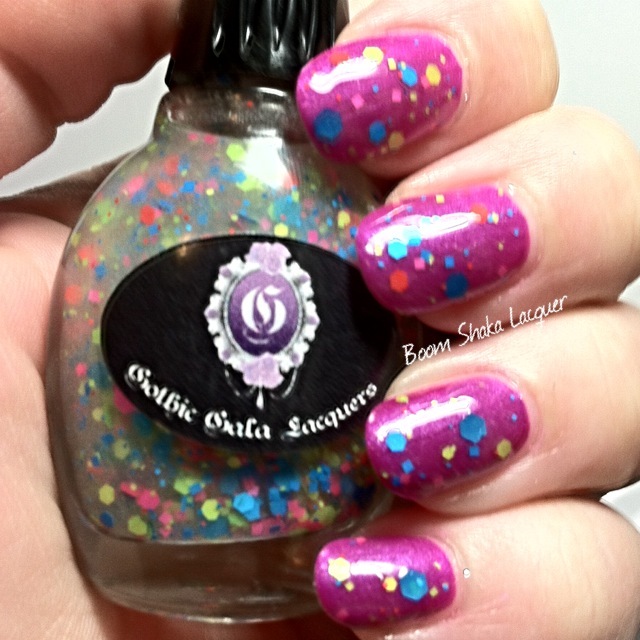 Because of the larger glitters I DO recommend a glitter smoothing top coat for a glass smooth finish! 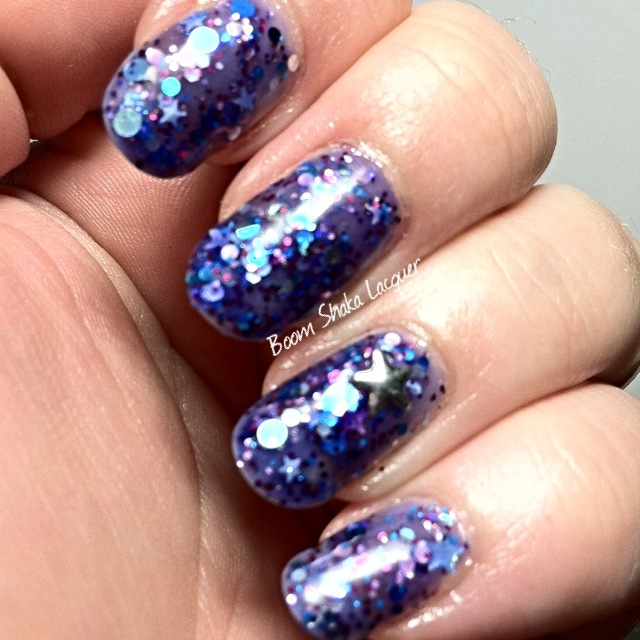 Products used: Glisten & Glow – Stuck on Blu; Jindie Nails – Patience is a Virtue; Nail Pattern Boldness – Glitter Food; Digital Nails – Ain’t Nobody Got Time for That Topcoat. So I know that you’re interested in where you can find out more about Jindie Nails and also maybe add some to your own “stash” You can keep up to date on all the news and happenings on Jindie’s Facebook Page and see loads of pretty pictures on Instagram. You can buy Jindie at many fine stockists around the world and of course from the Jindie Website (where she just happens to be running a summer sale with 20% off by using the code SUMMERSALE20 but only until the end of the month so move quickly)! 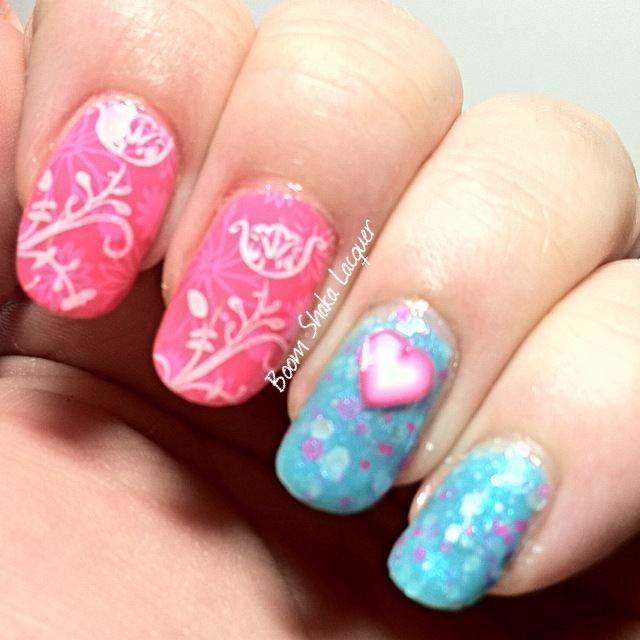 This entry was posted on July 30, 2014, in Indie Polish, Jindie Nails, Wednesdays We Wear Pink. 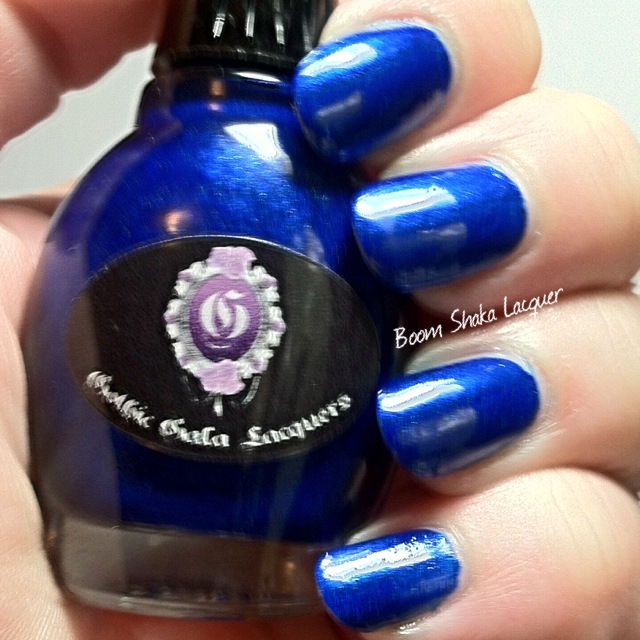 Gothic Gala Lacquers – Rave Collection Review! Readers have I got an explosively BRIGHT post for ya’ll today! Samantha at Gothic Gala Lacquers reached out to me and asked if I would like to review her new neon collection and I answered yes so quickly that I’m relatively sure that her head spun. I have been stalking my mailbox like a crazed addict looking for a fix…of course since I work from home and I often go to the mailbox in various stages of pajamas well…people may already think I’m a crazed addict. I digress! So Raves…I have to admit even though I graduated high school in the 90s I’ve never been to a Rave. I’m now what I would consider too old for a Rave but I have ALWAYS loved super bright flourescent colors! 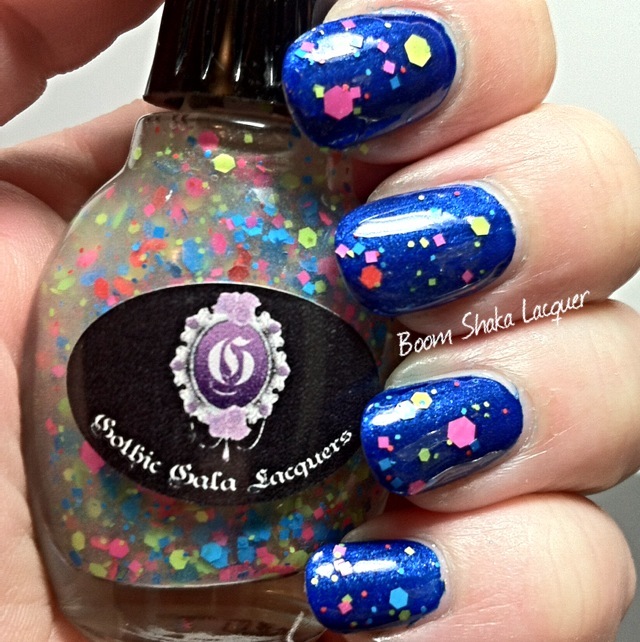 This collection from Gothic Gala Lacquers does not disappoint on that front! Not only that, the names are so very appropriate and I love them! Let’s start off with Wasted Youth! 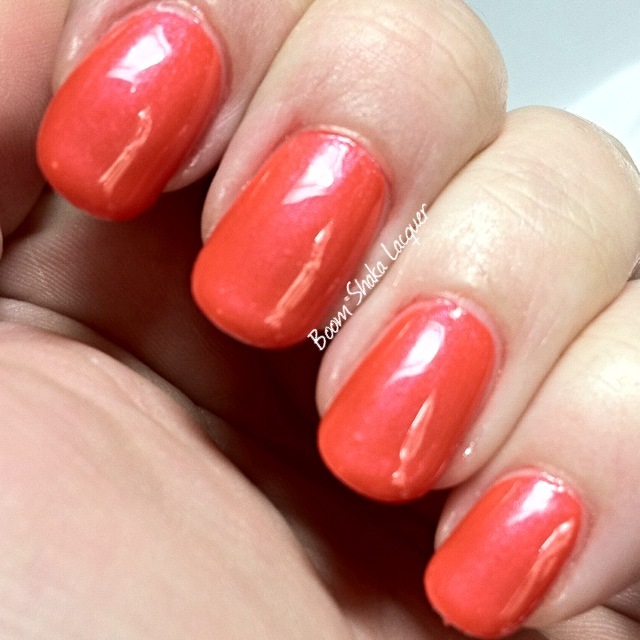 Now, this polish is a gorgeous glow in the dark reddish orange. Let me tell you this is a BRIGHT almost traffic cone orange but neons and bright colors are so difficult to capture! 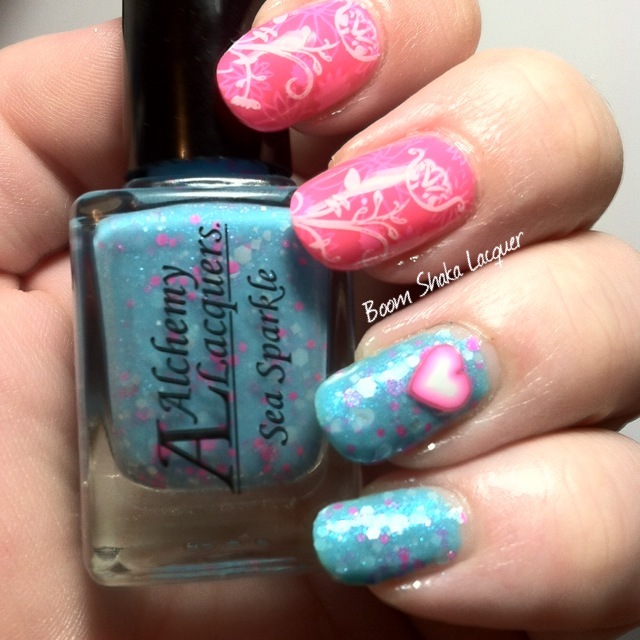 It also has a lovely pink shimmer that makes it very wearable. I was timid about it and then I got it on the nail and I was like oh yeah this color works! The formula on this is nice. It is somewhat thick so you may find that you need to thin it slightly if you’re having some trouble working with it. The trade off is that it’s a one coat polish. It dries to a matte finish with a VERY slight texture to it (due to the Glow in the Dark pigment) but topcoat sorts the texture right out. Oh wait did I mention this was one coat? Oh yeah. That’s right! Photos show one coat plus topcoat! Polishes used: Glisten & Glow – Stuck on Blu; Gothic Gala Lacquers – Wasted Youth; Digital Nails – Ain’t Nobody Got Time for That Topcoat. Next up we have what I *thought* was going to be my favorite one out of the bunch I was sent. S-extacy! Holy COBALT BLUE Batman! Seriously this is the most cobalty cobalt blue I’ve ever seen or owned. This coming from the girl who owns no less than five TARDIS inspired polishes (Don’t judge.) As if that wasn’t enough it’s shimmery as anything! The formula on this was extremely similar to Wasted Youth. A bit thicker than I’m used to but not unworkable. I do think that this must be related to the GiTD pigment as well as the slight texture. The thing about this one is that you will want to be very patient with application because it is awesomely pigmented and it can cause clean up around the cuticles to be a little time consuming. Photos show one coat plus topcoat! Polishes used: Polishes used: Glisten & Glow – Stuck on Blu; Gothic Gala Lacquers – S-extacy; Digital Nails – Ain’t Nobody Got Time for That Topcoat. Next up is my favorite of the solids! Face Melter! Is your face melting? 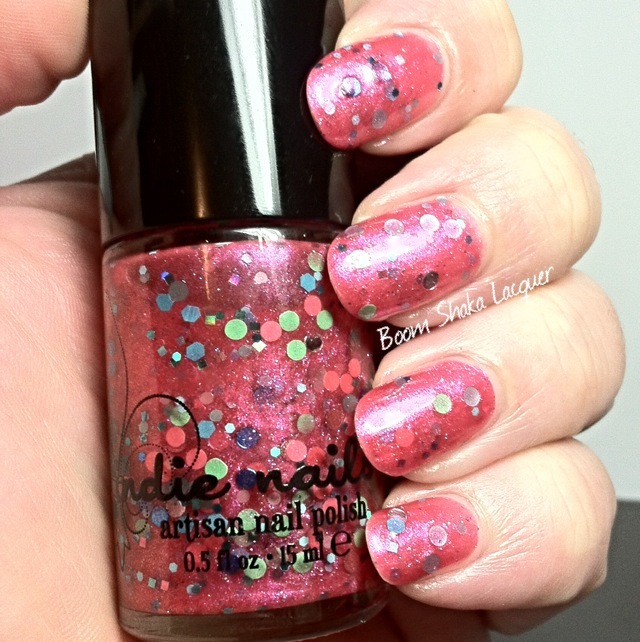 It should be because this is one hot mamma jamma of a polish! In the bottle I thought well isn’t that nice and I wasn’t as excited as I was about the blue and then I put on this awesomeness. 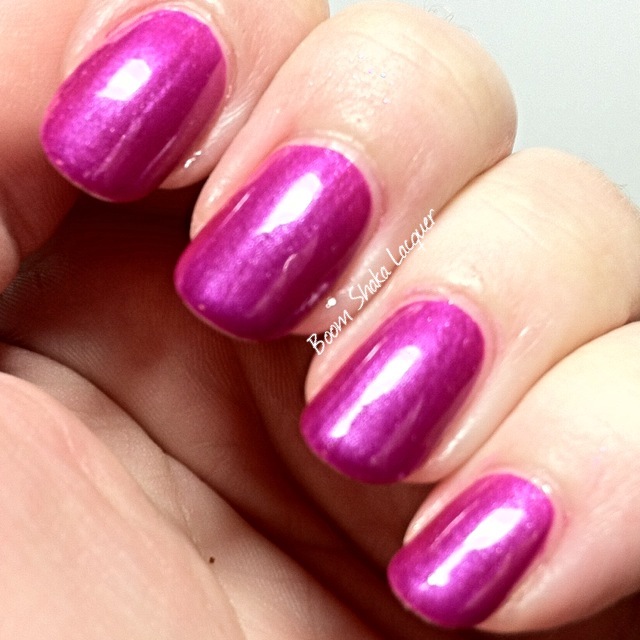 This is a gorgeous flourescent purple (heavy on the red) shimmer. It is so flattering on me and it was quickly elevated to my favorite of the bunch! Ahhh just look at that! 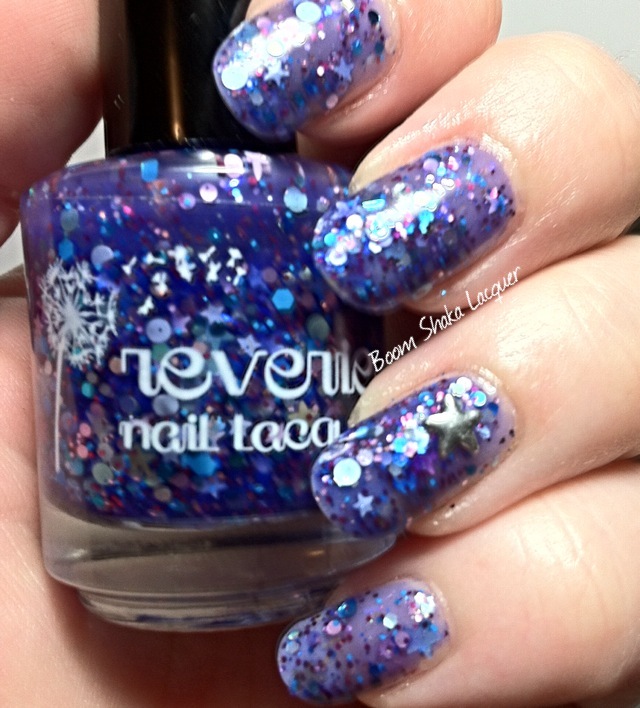 This one is a little thinner formula then the other two and I did do two thin coats for this polish. They all were very self-leveling and I didn’t have any problems on that front so I had no trouble achieving this super smooth application. Photo shows two thin coats plus topcoat! Polishes used: Polishes used: Polishes used: Glisten & Glow – Stuck on Blu; Gothic Gala Lacquers – Face Melter; Digital Nails – Ain’t Nobody Got Time for That Topcoat. 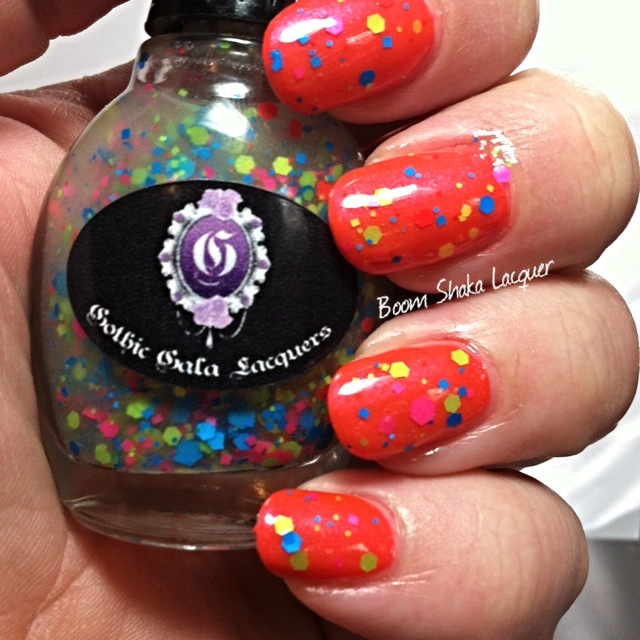 The fourth and final polish today is a matte neon glitter topper that also glows in the dark! Neon Night Life! I’m going to show it on all three of the previous colors because it truly goes with all of them PERFECTLY! I do prefer it on S-extacy and Face Melter but it totally works on Wasted Youth as well! I think that the GiTD pigment strikes again and this is definitely a thick glitter topper. Again one of the bonuses of this is that it practically needed no topcoat to achieve a smooth shiny finish. You definitely will need to employ the dab method however in order to achieve a nice even coat. In the end I love it over Face Melter the best though it looks amazing on the other two. All this pictures show one dabbed coat with topcoat. Polishes used: Polishes used: Polishes used: Polishes used: Glisten & Glow – Stuck on Blu; Gothic Gala Lacquers – Wasted Youth, S-extacy, Face Melter, and Neon Night Life; Digital Nails – Ain’t Nobody Got Time for That Topcoat. Overall these colors make me super duper happy and I’m totally loving how crazy bright and awesome they are! There are other colors too and I know that you are just dying to go check out the Rave Collection which are AVAILABLE now! You can purchase Gothic Gala Lacquers on their Website. Don’t forget to follow along on Facebook and Instagram for sneak peaks, sales, and other special things! 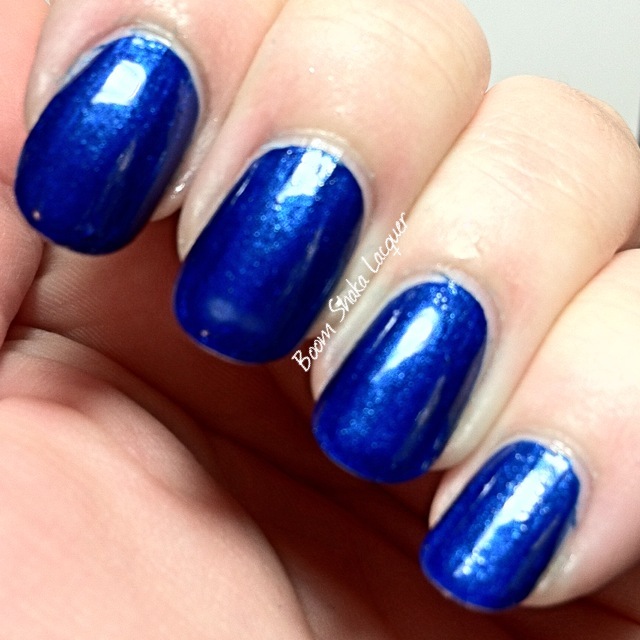 This entry was posted on July 20, 2014, in Gothic Gala Lacquers, Indie Polish.